It arrived with heavy hype! 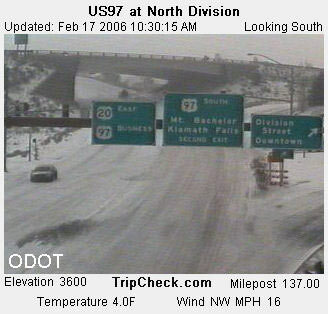 Frantic Storm Warnings from Portland's TV Weathermen filled the news hours for several days. In one bizarre scene a TV reporter held up a dog's paw for a camera close-up, and dire warnings advised to keep all your dogs indoors for danger of frostbitten paws, emphasizing that if you had to take a dog outdoors to keep them on grass because paved surfaces would lead to frostbite! Click to see Storm pictures at page bottom. Feb. 15th, the arctic air arrives in the very early morning hours with powerful, gusty N to NE winds. Feb. 17th, cold air is now in place, but coldest is yet to come. Crane Prarie records 16 below zero. Feb. 18th, the coldest day overall in the Cold Wave; Meacham records 19 below zero two times (Feb. 18 and Feb. 19). Feb. 19th, this is the day the arctic air dies out and winds calm; the cold wave is on its way out. Horse Ridge east of Bend records 20 below, coldest anywhere during this Cold Wave. Feb. 20th, the icy winds have ended and in the Willamette Valley the calm air creates the coldest morning low temperatures of the entire Cold Wave. 22 low temp, with average temp. for the day of 30, the lowest of the entire cold Wave! Feb. 21, the whole State has warmed up and the Cold Wave hits the history books as six days long, with Portland's lowest having been 22 degrees ABOVE ZERO. Second Note: It has been common throughout Oregon's recorded weather history, that the first two weeks of February can suffer the Winter's worst arctic air invasions. What was unusual about the above cold wave was not its severity, but its lateness in the winter. 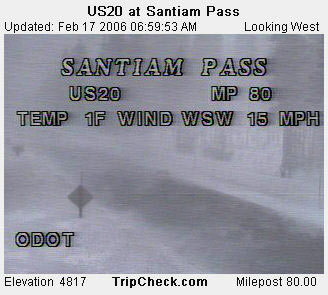 Note: although there was a slight amount of snow produced during this cold wave, it was restricted to zones east of the Cascade Range, and to the summits of the passes, such as the VERY blizzardy, frigid picture of the summit of Santiam Pass of Feb. 17th (note the 15mph winds and blowing snow)....But west of the Cascades, there was an absence of any snow cover, eg. 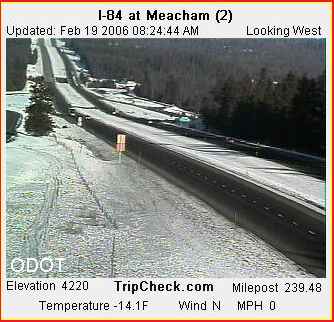 in Portland, and this acted to moderate the cold wave's effects West of the Cascades.